She Said Feck! Welcomes Sound Drown to the Family! We’re very excited to welcome Saint John’s Sound Drown to the SSF Family! Sound Drown was originally formed by founding member Brandon Wiseman. Having songs written for the band, Wiseman began putting together the lineup with himself sticking to bass and lead vocals. Agreeing to test the band’s chemistry by playing covers to start enabled him to find the right people for the band. Wiseman ended up going through numerous lineup changes and several shows before finally finding drummer Drew Neathway, lead guitarist / backing vocalist Nick Ryan, and rhythm guitarist / backing vocalist Justin Goss. It wasn’t long before they were able to release the debut EP, “Dino Droppings” and the record is a testament to where the band is with their sound right now. WOW, we can’t believe we are one! We have had a crazy year, filled with so many ups and downs and wondering if we were really cut out for this? The answer is YES! We’ve released two albums, one physical and one online, travelled to countless festivals and shows and made so many new friends along the way! We wouldn’t be here without our label-mates CHIPS, Tortoise the Hare & the Millionaire and Melonvine and the numerous venues, festivals and NB musicians we have worked with over the past year. We’re celebrating our BIG BIRTHDAY with two shows! Tortoise the Hare and the Millionaire have been working hard on their debut EP set to be released November 2nd. Record in Fredericton by Dylan Ward (David in the Dark, Marian) and produced by Kelly Waterhouse (The Hypochondriacs, Dub Antenna). The self titled EP will be available on all streaming sites and local record stores on November 2nd. See them at The Capital on November 3rd for the EP Release party with special guests Kendra Gale, Kelly Waterhouse, Jeannine Gallant, Jonnie Price and more! We're super excited to present Diner Drugs in Fredericton @ The Capital Complex on August 25th. Joining them Fredericton's Hard Charger and Beard SpringSteen! Doors 10 pm // Show 11pm, $8 Cover at the Door. We're excited to welcome up and coming 3 piece grunge/rock band MELONVINE to the She Said Feck family! Hailing from Moncton, Melonvine is a 3 piece grunge/rock band who in two short years have already gained considerable attention for their first single Flowers off their EP Co-Dependent which has included commercial radio play in several markets in Canada. They have shared the stage with such acts as Black City Avenger, Sound Drown, Kilmore, Dazor and many more. In 2017 they participated in their first showcase through Music NB Festival 506 alongside Kill Chicago, The Motorleague and Lionsault. Welcome! We are stoked to bring our label mates CHIPS, Tortoise the Hare & the Millionaire and some of our favourite NB bands to Fredericton, Moncton and Saint John over the course of the month of March. 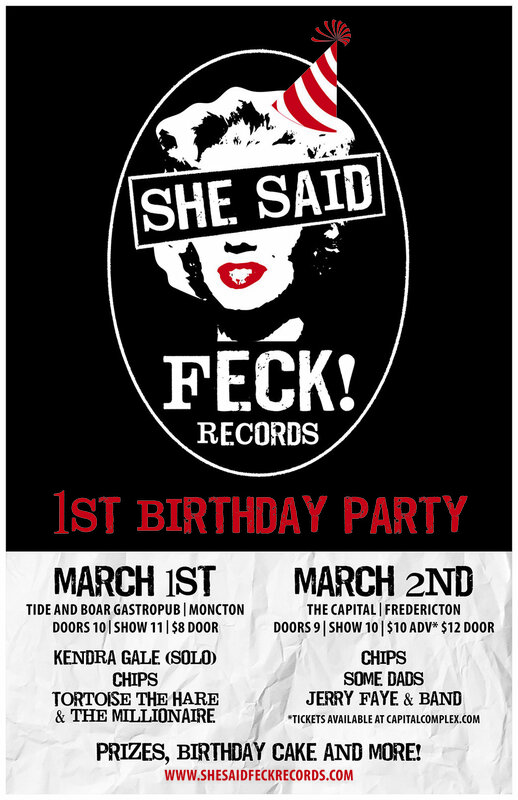 She Said Feck Records is proud to announce our initial launch! We are proud to represent pop-punk four piece CHIPS and blues rock trio The Tortoise the Hare & the Millionaire.